The ultimate symbol of luck and chance, the Wheel of Fortune (X) signifies change, both good and bad. The tenth card in the Major Arcana is a reminder that sometimes we are at the mercy of fate, and all we can do is wait for our luck to change. 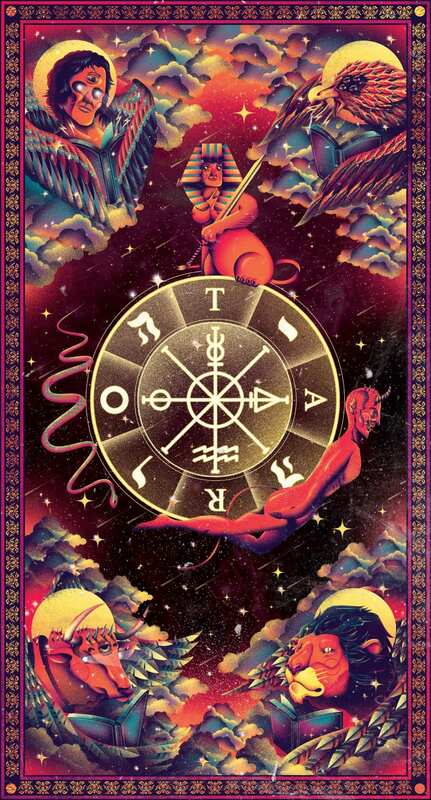 The Wheel of Fortune card is full of symbolism and iconography. At its center is the wheel of fortune itself, which represents luck, chance, and the cycles of life. On the wheel are the letters TARO, and in between these are the Hebrew letters that spell out YHWH, or God of Israel. In the corners of the card are the Four Evangelists, the Lion, the Ox, the Man, and the Eagle. The Four Evangelists also correspond to the fixed astrological signs — Leo, Taurus, Aquarius, and Scorpio. Each of the figures are reading a book, suggesting intelligence and self-understanding. Surrounding the wheel are three creatures of mythology — the sphinx, the snake, and Anubis. The sphinx sits atop the wheel, representing the gods and kings, as well as the importance of staying balanced amidst change. The snake is the Greek god Typhon, descending toward the left side of the wheel just as evil descends into the material world. At the bottom of the wheel is the Egyptian god of the underworld, Anubis. He rotates along with the wheel and the sphinx, symbolizing the cyclical nature of good and bad luck. At their core, a person who draws the Wheel of Fortune card is lucky. You are highly intuitive and are drawn to relationships with good, kind people. However, this does not mean that you have led a charmed life, as the Wheel of Fortune also signifies someone who has lived through a lot of change and has emerged stronger for it. You are highly empathetic and a champion for the weak. These qualities can make it easy for people to take advantage of you, so you must remember to advocate for yourself like you do for others. The Wheel of Fortune is a sign that the universe has a plan for you and you are going to fulfill your destiny. Something in your life is going to change for the better. But it is also a reminder that life operates in cycles, so prepare yourself for sudden change and remember that both good and bad luck is temporary. Above all, the Wheel of Fortune signifies positive change in your love life and how fate is at work. If you are single, this can mean that you are going to meet your true love soon, so now is a good time to put yourself out there. If you are in a relationship, this card shows that you and your partner are going through a rough patch and that change is forthcoming. You may improve your communication with each other and the relationship will improve, or a breakup is in the works. Discuss your goals with your partner to see if they are compatible. The Wheel is a good omen for career change, so now is the time to start a passion project or apply for your dream job. This card can also mean that a promotion is coming your way and that you must work hard and keep your head clear. If you’ve been having money problems, the end is in sight. You will be earning a raise at work or a generous friend or family member will come to your aid, but you must ask before you can receive. On the other hand, if you are financially comfortable, you will experience a shortage of money soon. Add more to your savings for the time being, but don’t worry — your financial troubles should quickly pass. Again, the Wheel represents a change in fortune. If you have been suffering from health problems, you will be recovering soon. If you have been healthy lately, you may soon suffer injuries or fall sick. These ailments will not be serious though. Instead, they should serve as a warning to take better care of yourself and not to push yourself too hard. When reversed, the Wheel of Fortune represents chaotic energy and an upcoming change for the worse. Negative external forces have been influencing your life and taking you off your path. This card means that you need to handle change with grace and learn to accept that there are things you cannot control. Things have fallen apart in your relationships. If you’re feeling heartbroken, your former relationship is hanging over your head and preventing you from doing the things that make you happy. Try to move on — attempting to rekindle the romance will only have negative consequences. If you are with somebody, the Wheel card means that your relationship has lost the spark it once had. Engage in activities the two of you enjoyed when you started dating — if this does nothing to spice things up, you should take it as a sign that it’s time to move on. You are at an impasse in your career. Working a dead-end job or for a company that doesn’t respect you has you feeling down. You may be laid off soon or endure more day-to-day drudgery. Take this time to reflect on the choices you made that led you to this point. Ask yourself where you’d like your career to bring you, but don’t make any big moves just yet — wait for the Wheel to spin up before taking the leap. When the Wheel of Fortune is in the reversed position, it isn’t the right time to gamble or take financial risks. Avoid loans and major purchases right now and focus on saving. Do your best to avoid temptation from sales and advertising until your spell of bad luck passes. This chaotic period of your life is negatively affecting your health. Your weight and skin in particular are suffering from neglect. While you can’t control outside events, you can control how you react to things. Avoid turning to food, alcohol, or drugs during times of upheaval. The Wheel of Fortune in the past position indicates that the numerous challenges you have overcome have made you who you are today. Your resilience has allowed you to come closer to achieving your life goals. In the present position, the Wheel of Fortune means that chance is on your side. Good things are coming your way, although they may first appear as obstacles. Don’t wait too long or the opportunity will pass you by. When found in the future position, the Wheel of Fortune represents an impending change. This change can be positive or negative — all will depend on your internal strength and ability for self-understanding. 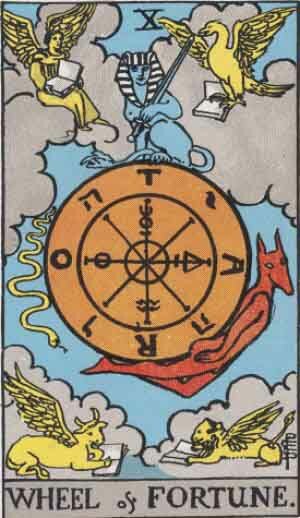 The Wheel of Fortune is constantly in flux. Depending on the context, it brings either a positive or negative spin to the card it is combined with. In a pairing, the Wheel of Fortune may also symbolize a change in circumstances or a recovery from a personal tragedy. The Hermit represents solitude and a quest for self-knowledge. When combined with the Wheel of Fortune, it means that you will soon find yourself alone. You may go through a break-up or a loss of a loved one in the near future, but you will emerge from this experience with a greater understanding of who you are. This pairing is a sign of second chances. If you regret not taking risks in the past due to fear or laziness, now is the time to make it right. Be on the lookout for new opportunities, especially if your first instinct is to dismiss them, and take a chance. Together, the Wheel of Fortune and the Ace of Pentacles are harbingers of very good luck. You are in store for a financial windfall or a health miracle. The Wheel of Fortune is a yes. Since it symbolizes a change in fortune and destiny, do not be discouraged if yes is not the answer you wanted, as everything is going according to the universe’s plan.